In March 2013, MoMA PS1 invited artists and designers to rethink the post-Sandy Rockaways, a peninsula of Long Island located in the New York City borough of Queens. The competition sought ideas for alternative housing models, creation of social spaces, urban interventions, the rebuilding of the boardwalk, protection of the shoreline, and actions to engage local communities in the effort to rebuild from Hurricane Sandy. 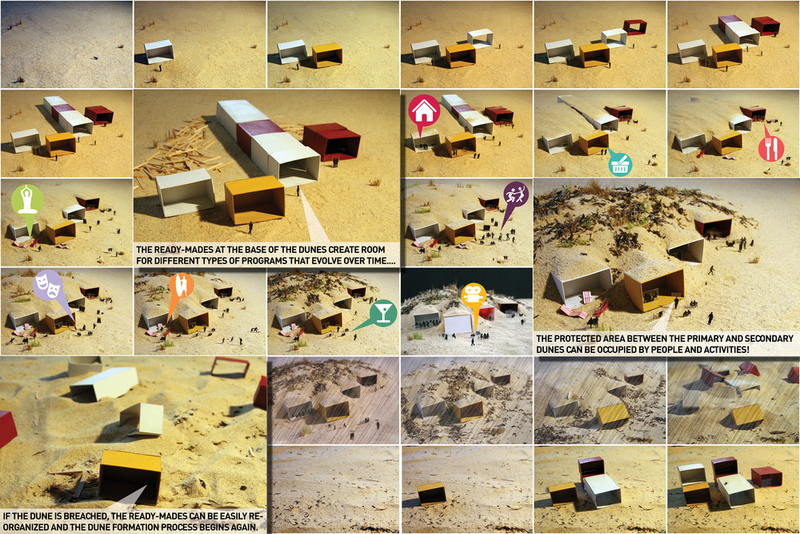 Balmori’s “Occupy the Dune” was among the twenty-five proposals exhibited on Rockaway Beach. Balmori proposed an infrastructure as the center for civic activity, capable of protecting the community while connecting it socially and ecologically. Vegetation that colonizes the dunes surface is the most critical part of the ecosystem, adding strength and stability against extreme blunt winds and storm surge. Many inhabited coastal areas have flat beaches that leave the city exposed to violent storm events. Creating dunes makes these areas more resilient, but can separate the community from the coastal landscape. The protected area formed between the primary and secondary dunes is less sensitive, allowing this interstitial space to become a linear park capable of hosting an array of civic and recreational activities. Prefabricated concrete storm drainage boxes are used to create void spaces in the base of the dunes, leaving room for different types of programs that can evolve over time. The flexible void spaces can accommodate temporary housing for displaced residents, community activities, cabanas, cafes, retail shops, and can act as passages between city and coastal landscape.